Cauliflower fried rice with shrimp is a healthy and delicious vegetable-based alternative to traditional Chinese stir-fry. Cauliflower florets substitute white rice for this savory one-pot meal. 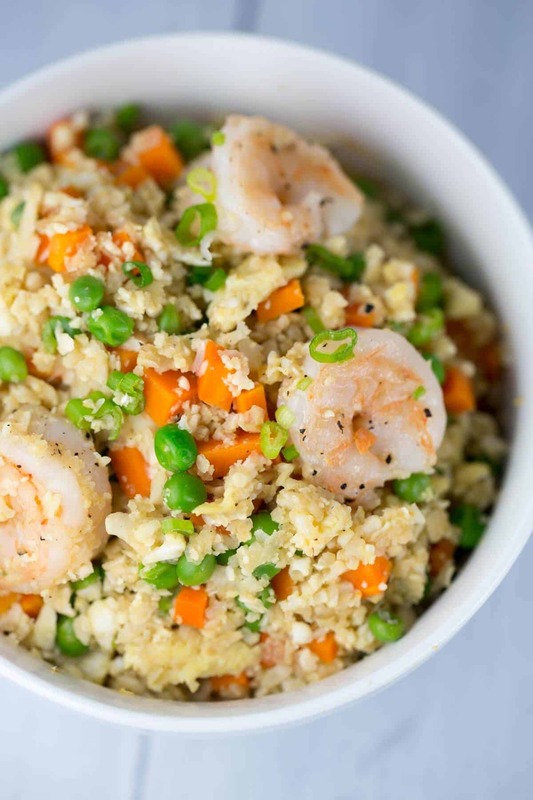 A traditional Chinese dish gets a healthy twist with this shrimp fried cauliflower rice recipe. My family loves their comfort food, and with this meal, I’m able to add more vegetables on their plates without sacrificing taste. This quick stir-fry is prepared in a wok, where any protein and vegetables can be mixed in with the rice base. With this popular Asian meal, cauliflower can be substituted and made into grains of rice. In doing so, this recipe becomes healthier with fewer carbs, and it’s also grain-free. Using cauliflower instead of rice cuts the preparation time down significantly as you don’t have to boil the rice and wait for it to simmer. The cauliflower can be added directly to the hot wok and saute with the other ingredients. The first step for the dish is to transform a head of cauliflower into rice-shaped pieces. I used the largest hole on my handheld grater to break down just the florets (no stems). There are multiple ways to make cauliflower rice, giving versatility with the tools you already have in your kitchen. Cauliflower is a cruciferous vegetable packed with nutrients, especially fiber, vitamin C and K. It is a lower carbohydrate alternative to white rice, allowing you to add more vegetables to each bite. The cauliflower rice is an excellent alternative for other tasty meals like teriyaki tofu and kung pao chicken. Here comes my favorite part! In a big wok, add carrot, peas, and cauliflower rice and fry until all of the vegetables are tender but not mushy. Scrambled eggs, soy sauce, salt, pepper, and the pre-cooked shrimp goes in next to bring all of the goodness together in one hot pot. Just looking at the picture, if I hadn’t told you that there was no rice in the dish, would you even know? Each piece of cauliflower is light and tender and is seasoned nicely with the savory soy sauce and freshly ground pepper. Sometimes my family would add ham, spam (yes spam), bacon, cabbage, mushrooms, bean sprouts, corn or cashews into the dish. Play around and add your favorite ingredients to mix it up! To me, nothing beats rice in a traditional fried rice dish, but it’s nice to have another tasty option when you’re looking for a healthier meal. Woks are efficient for quickly cooking food because their round bottom shape creates a large surface area. Make sure to preheat the wok and oil over high heat so that the oil can reach a temperature of 415°F (212°C). Cooking the shrimp and vegetables in a single layer at separate times encourages maximum Maillard browning and flavor, especially for the cauliflower rice. What a brilliant idea. I would never have thought of using cauliflower as a substitute for rice but this dish totally works. It even looks like rice. It’s so much more nutritious than white race. Thanks Janice! Yes, its definitely a nice alternative if you are trying to cut back on your carbs! I recently changed my way of eating to low carb high fat and love finding new ways to eat foods that I love – but really shouldn’t eat. Shrimp Fried Rice was always a favorite of mine, but I don’t eat rice anymore. So, when I found this recipe, I was over the moon….I tested it out last night and it was a HIT!!! It really tastes like the real thing! I was very satisfied! The carb count on this dish is PERFECT and this site is definitely going on my fave list of food blogs! I made this tonight and was totally amazed at how great it tasted!!! I substituted coconut oil for the vegetable oil and did 1 tablespoon of soy sauce. I gobbled it up without having even realizing! My husband was skeptical of the cauliflower Rice and he too was very impressed! This is now a go to low carb, high protien bowl of yumminess!!! Hi Ade- Yay for cauliflower rice success! I’m so happy to hear that you and your husband enjoyed the recipe. Definitely a great low carb option 🙂 Thank you for your feedback! Looking forward to sharing more recipes with you! Made this last night and it was delicious. Only thing I changed was I used organic frozen mixed veggies that had peas, carrots, green beans and corn. Even my very skeptical husband thought it was good, and he doesn’t like anything healthy. That is amazing Heather! You must have done a great job with the recipe. I’m so happy to hear everyone enjoyed the healthier meal! Wow. I think I’ve died and gone to heaven. That was delicious. We’ve been trying to reduce our carbs and are loving the bright taste of the fresh veggies. My husband loves fried rice and this has rocked his world. Wow Karen! I am so happy that both you and your husband enjoyed the recipe and found a substitute for carbs 🙂 Thank you for you comment and making me smile! I just made this and it was AMAZING!!! This was my first time making cauliflower rice, I’ve heard so much about it and was too sceptical. I’m a believer now! I used double the shrimp and added a bit more sesame oil. Yay Priscilla! I’m so happy that you enjoyed the recipe and wasn’t afraid to try something new and different 🙂 More shrimp is always good! I need to buy a wok. what brand /type of woke is the best? What is the size that you use? Hi George! I use a Calphalon Unison Nonstick 13-Inch Flatbottom Wok with Lid. There is a link in the recipe post highlighted in pink, click on the word “wok”, so you can see the product in amazon. It’s underneath the photos of me stir-frying the rice in the wok on my website. Thanks! Trader Joes now sells fresh “Riced Cauliflower” already prepared in a bag. It’s in the produce section. Yay! Very very good. But too much work grating the cauliflower. But my son said he would grate it next time if I would please make it again. Thank you Mary! I would take your son up on that offer 🙂 I’ve seen pre grated packaged cauliflower at Albertson’s if you need a quick solution! This was fantastic!!! I left out the peas and carrots to keep it extra low-carb and added bacon. Soooo good! I loved the recipe. Thanks!! Thank you Brittany! I love your idea for adding bacon, yum! Can this be reheated next day? If so how did it turn out? I usually like to take leftovers for lunch. Hi Kim! I think it would taste best eaten the same day, but you can definitely reheat for a minute or two in the microwave. Perhaps have some extra soy sauce on hand or salt and pepper if you want to refresh the flavor a little bit. I know the recipe says it makes 4 servings. What is the size of an approximate serving – 1 cup etc? Trying to log the recipe for Myfitnesspal :). BTW my husband loves this more than regular fried rice which is a huge compliment not only because he is a picky eater but because shrimp fried rice is one of his favorite dishes. He asked that I put this in our meal rotation :). Thank you for the great recipe it is delicious!! Hi Angela! Thank you so much for the feedback 🙂 One serving is about 1 1/2 cups with all of the vegetables and shrimp. So happy to hear that your husband enjoyed the meal! My guy is picky too, haha. This was delicious! I swapped olive oil for the vegetable oil, since I didn’t have any on hand, and diced green beans for peas. Super delicious – I could have eaten so much more than 1 serving! Love having meals like this that make me feel like I’m cheating but are actually really healthy. Yay Jamie! I’m so thrilled to hear that you enjoyed the recipe. I like your substitutions, I’ll have to try it! I’m new to the diet seen. I’ve always been healthy and pretty thin. But now that I am reaching 40 it is time to take a hard look at my diet plan and that’s when I stumbled on this recipe. We don’t eat peas in my house so I switched with geeen peppers. Everything else is pretty much the same. It came out great and I am using it as part of a meal prep that I am doing. I see your nutrition facts are broken down by serving size but it doesn’t say what this size is. I guess I can assum one cup? Just need to add the information for my daily log! Hi Domicus! Thank you so much for trying the cauliflower fried rice recipe. I’m so thrilled to hear that you had success! The serving size is about 1 1/2 cups of the rice. Hi Vera! As long as you enjoy the flavor, than the appearance is not as great of a concern. You can always reduce the amount of soy sauce if desired. Sometimes I use low sodium soy sauce and that tends to be a little lighter in color. Thanks. Recipe was so good!!! I just made this tonight and we loved it! I added more veggies such as red bell pepper, zucchini and mushrooms. I seasoned to taste. Thank you for this great idea! Cooked this tonight – only changes are that I used frozen cauliflower and added sliced Brussels sprouts. Excellent dish! Thank you! I love your frozen cauliflower substitution and adding brussels sprouts! Jessica this sounds so good. I really enjoy the river cauliflower. I once stuffed the minutes peppers with it and my husband loved it. Thanks and always cheering you on. Tried this last night and it was delicious and healthy!! The texture of the cauliflower rice is perfect and satisfies the need for a starch such as rice or pasta. Hi Stephanie- I would say about 1.5 cups of shrimp fried cauliflower rice per serving. Thanks! Jessica, thank you for the recipe! I just made it tonight and I got a two thumbs up from my husband. It was so tasty. I added zucchini cause I need lots of veggies (I don’t think it made a big big difference). Made it with cauliflower riced and I’ll be making it again. Can you freeze and reheat leftovers? Hi Julie- I think it would taste best refrigerated and then reheated, eaten within 3 days. Thanks! This is amazing! I used 1 teaspoon coconut oil in place of the vegetable oil, one egg and two bags of frozen cauliflower rice. Whoo hoo! Thank you for your feedback Lisa. Did you get the frozen cauliflower rice from Trader Joes? Is the carbs for the whole recipe or is it divided by the amount of bowls i can make this this dish. Hi Angelica- The carbs are per serving (4 servings in the recipe). Thanks! OMG this is crazy good! Eating as I am typing. It tastes like the real thing with no guilt. Two thumbs up! I would probably make a few changes to this recipe. One, I would add ginger to the garlic stage. Two I would mix both the cauliflower rice with broccoli rice and leave out the peas. Finally, I bought larger shrimp (16-20) and found it was more satisfying. This dish could be taking to a higher level with many more vegetables and a more significant sauce. Hi Kay- I think these are great suggestions! You can add any vegetables you like to the base and bump up the sauce to your taste. Appreciate the feedback! You have converted me with this delicious recipe. 1st time I ever tried cauliflower rice. I absolutely loved it!! Thank you for this recipe.